Those involved in construction have to cope with so much learning in their own discipline that they shun further involvement in subjects such as insurance and law which in themselves are so deeply and intensely complex. However, insurance and law are interwoven in the basic procedures used in the construction industry for undertaking work, be they design, construction, supervision or operation, or any combination of them. 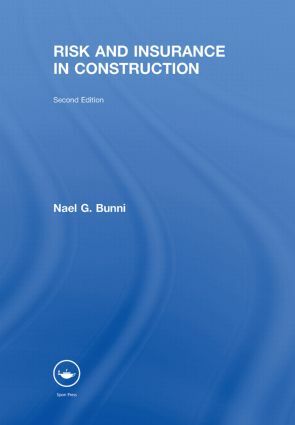 This thoroughly revised edition of Nael Bunni's successful book, formerly called Insurance in Construction, provides information on risk, construction law and construction insurance for those involved with all aspects of construction. The chapters on risk have been expanded to include recent developments in the area and provide further examples of events which could occur on what can be viewed as the most risky human work activity, namely construction. New chapters are also added to deal with the insurance clauses of the many new standard forms of contract published in recent years, including FIDIC's new suite of contracts published in September 1999, ICE's seventh edition of the civil engineering standard form of contract, and ICE's second edition of the design/build form.